Thank You TERI, Thank you US Consulate for making us special. I was amazed and very pleasantly surprised to see Abhishek Bachchan gracing the occasion on dot time. I hardly watch movies( any movies, I mean ), nor I am a fan of any stars. But people always comment on whims and fancies of stars. Abhishek Bachchan was not only on time but stayed till last to encourage all heroes and young filmmakers. Stood for photos with them. 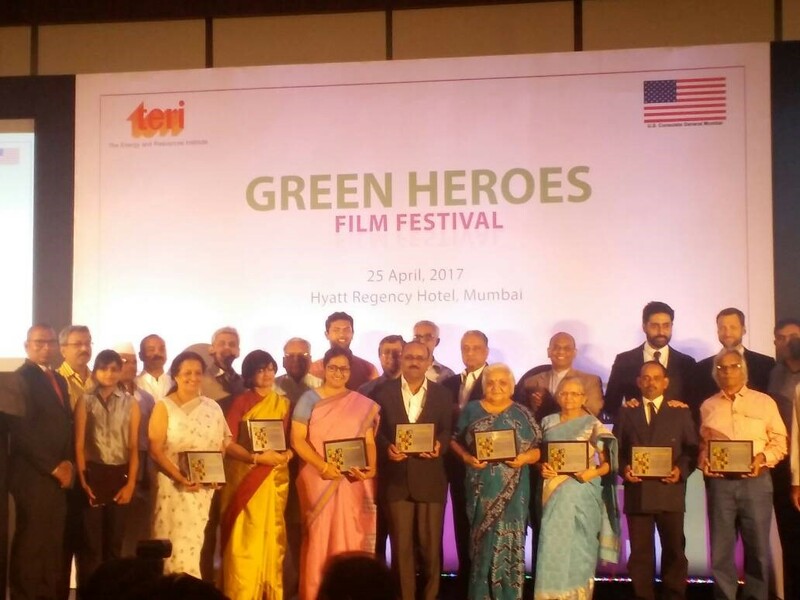 As a part of efforts to acknowledge works of individuals and organizations working in environmental filed, TERI and US consulate identified Green Heroes in the five Western Indian states. – Chattisgarh, Goa, Gujrath , Madhyapradesh & Maharashtra. TREI short listed these Green Heroes by methods of Selection and recommendations. 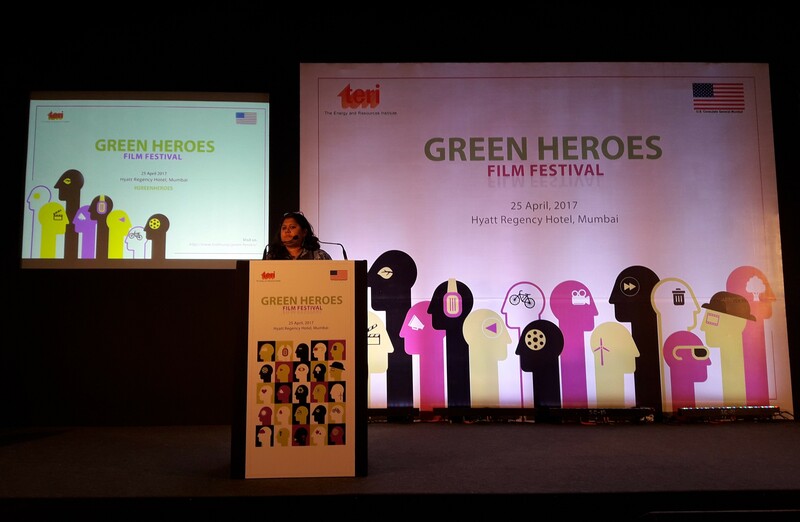 To pair this, young and new filmmakers were encouraged to make short films on these Green Heroes. Those filmmakers were given training through workshops. Ace actor Mr Abhishek Bachchan , U.S. Consul General Thomas L. Vajda, Dr Ajay Mathur, Director General TERI and Jury members were present to felicitate “Green Heroes” of western India who were showcased in short films highlighting the grassroots environmental work that the heroes are doing in their local communities. 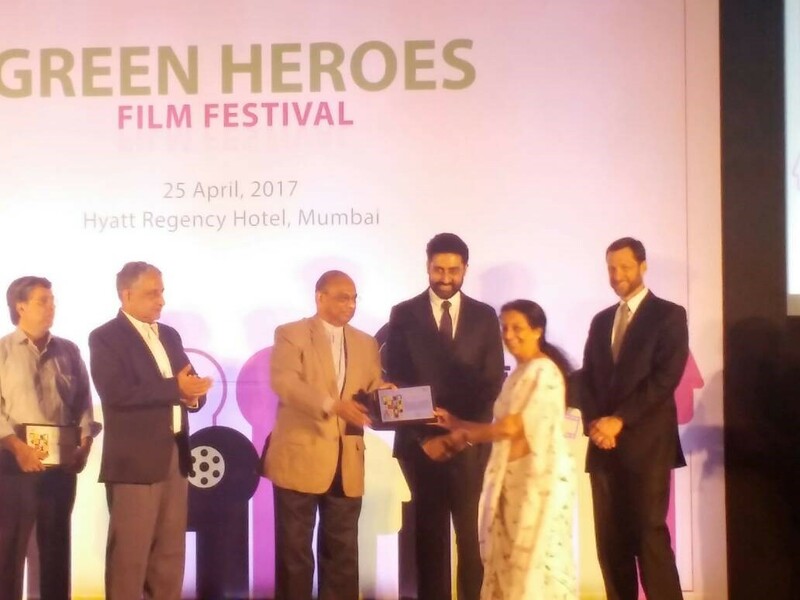 Jeevitnadi-Living River Foundation was amongst the Green heroes short listed. I feel greatly honoured to be a part of Jeevitnadi- Living River Foundation, which opened the platform to showcase our works. Our Organization’s work was highly appreciated by TERI. I feel extremely happy to witness the same. I wish to share this news with all and feel proud and privileged to be working as a member of Jeevitnadi-Living River Foundation. Due to untiring efforts by all the members, we could achieve so much in such a little time. When one witnesses such occasions, it is not just a matter of honour but a pat on your back for the work we have been doing. We all know it well that reviving the Rivers is a tough challenge and many a times the picture looks so grim that we always feel low and doubt whether “will we be able make any changes for our future generations? “ But we, the volunteers are all prepared to face it. Such incidents like TERI Awards, give us strength. The program was very meticulously planned. The Green Heroes were received very well. TERI staff was there taking care of all heroes in person. All top officials had a personal dialogue with every one. The function was grand yet personal in a way. This was something unique to experience.